With a common name that really fits, Kalanchoe orgyalis (Copper spoons) (see picture right) is a remarkable foliage plant. And yes the foliage does really look like ‘copper spoons’. Also said to look like ‘Shoe Leather’, one of the great things about K. orgyalis is that the internodes are short, making for a naturally bushy and much branched plant. This wonderful plant will reach nearly 2m, a small shrub under ideal conditions, when grown in containers and even the rock garden it it often much smaller to around 50cm. However this is a slow growing species so you may need to patient. Kalanchoe orgyalis requires a well drained position in full sun to part shade. It is frost tender, so if you are in frost prone area, try growing in a container so that some protection can be given. Again do not over water, a dry winter is appreciated. Do not mist or spray foliage as this can cause fungal problems. Allow the growing medium to dry between waterings. You can test this by using a moisture metre, pushing you finger into the growing medium, or testing the weight of the pot as against immediately after watering. Fertilise in spring through summer with a liquid fertiliser, or you can use a 3 month slow release type fertiliser in spring. After flowering, prune away the old flower head to tidy up the plant. It should flower again the following spring. 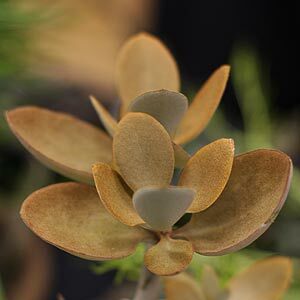 Kalanchoe orgyalis can be grown from seed, stem cuttings or leaf cuttings.